Boat builders of late have been trying to tap into the entry-level/budget-minded buyer market, and many have offered boats devoid of the amenities and style that make their brand special. 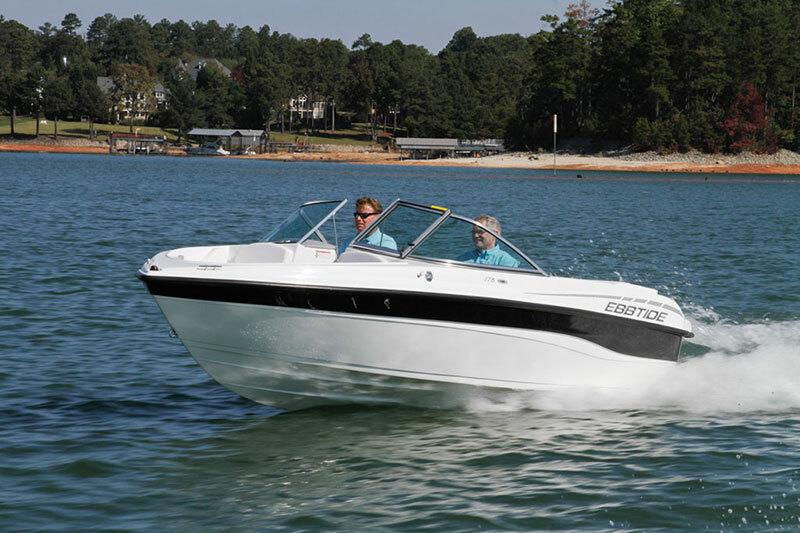 For 2013, Ebbtide unveils the 176 SE, its newest, smallest and least expensive boat. But what the designers managed to do was distill the essence of the brand in a package that “represents,” as the younger generation likes to say. Keeping it budget-friendly also means not needing a Hummer to tow this 17.5-footer that weighs 2,100 pounds. Readily noticeable is the cockpit depth, which measures nearly 30 inches, making it safer for kids. One thing this Ebbtide doesn’t scrimp on is interior appointments. The upholstery is a stout 33-ounce vinyl with a top coat for protection against UV rays as well as assaults from colorful kid beverages. 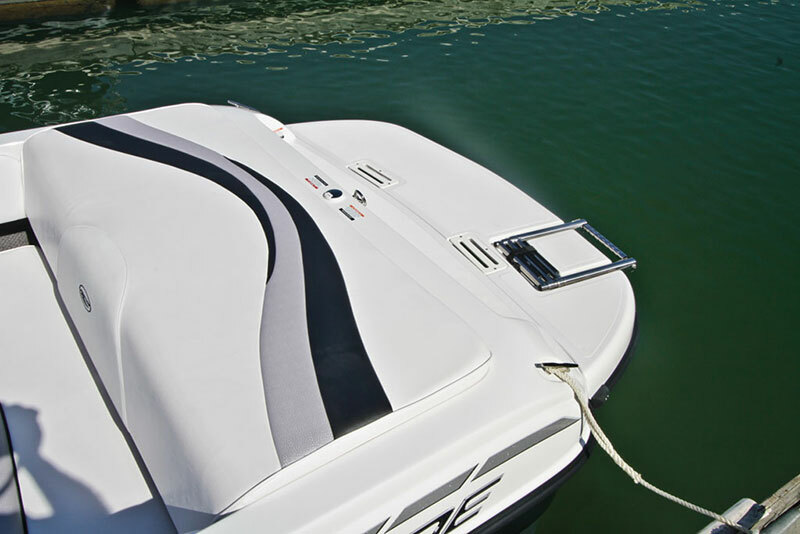 Our test boat is clad in the Sterling Gray Package, which pairs white vinyl with accents and matching gray dashes and carpeting. 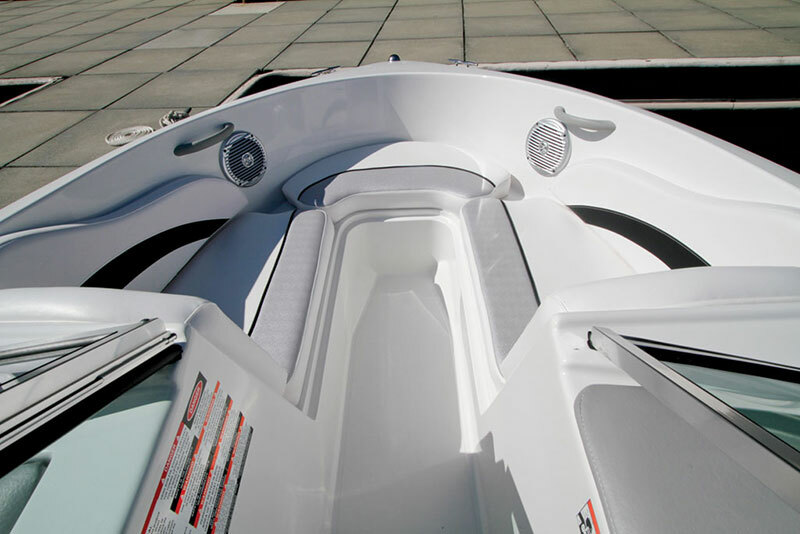 The 176’s Sport interior layout includes twin adjustable high-back bucket seats along with a stern bench that has a backrest with a pleasing amount of recline as well as a curved transition to the large sunpad. Our boat has the optional extended swim platform, which is a must for watersports. To keep the price low, the 176 is paired with the four-cylinder MerCruiser 3.0L MPI with a catalytic converter for reduced emissions. Putting out 135 hp, it moved us along smartly. Time to plane was 3.4 seconds with minimal bowrise, and it reached 30 mph in 8.8 seconds. We reached a top speed of 42.2 mph, which is just fast enough to lose a hat. The helm features a full gauge array tucked under the padded dash and a stylish chromed-up wheel for added flair. The 176 SE is ready for action with a standard ski tow and plenty of ski storage in the deep centerline ski locker, which is rare for boats less than 18 feet long. At the port-side console is the stereo remote control for the four-speaker MP3-ready AM/FM stereo. 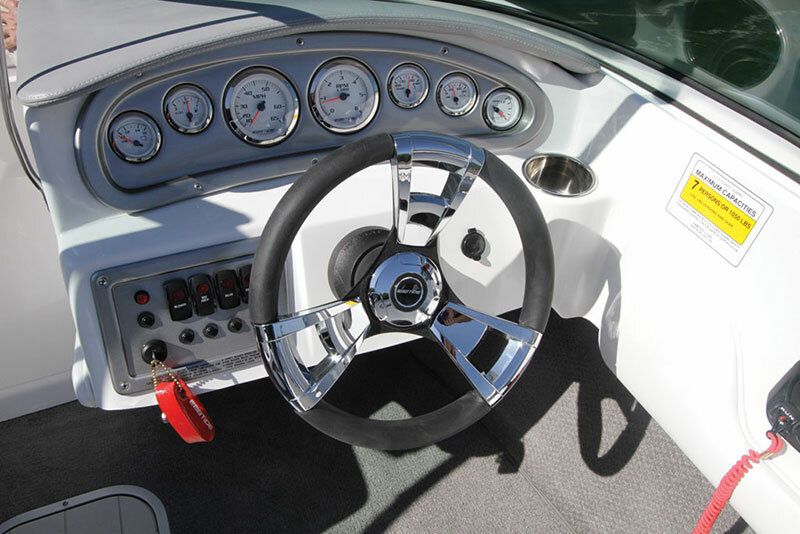 Built into the dash is a cooler that drains overboard like the under-seat cooler in the surprisingly roomy bowrider section, which features high-backed recliners and ergonomically pleasing armrests. LOA 17 ft. 6 in. Beam 7 ft., 2 in. Bimini top, digital depthfinder, choice of hull colors and more.